I love polenta. The instant kind, that you make in a few minutes but it still kind of tastes like you stirred it for half an hour. I also love lasagna, kale, mushrooms, and ragu. Here, I have combined my favorite things (minus cheese and chocolate) to make a delicious dinner. Prepare the polenta according to the directions on the package. Line a cookie sheet with a large piece of foil, and grease lightly. Once the polenta is cooked, spread it thinly in the foil lined pan and let cool completely. 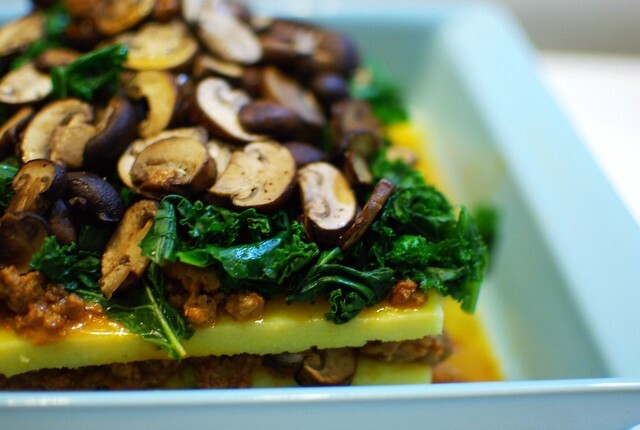 When the polenta is cooled, tear the kale into little pieces and steam quickly. Set aside, and cook your mushroom slices in the olive oil with the pepper. Pick out the dish you're cooking your lasagna in, and spread a thin layer of ragu over the bottom. Cut the polenta into quarters, and lay one slice on the ragu in the pan. Spoon another scoop of ragu onto the polenta base, then spread half the kale over, then add another polenta. Next add more ragu, half the mushrooms and the rest of the kale, and another polenta piece. Add another scoop of ragu, then the rest of the mushrooms, and the last piece of polenta. Spread ragu over the top, dump however much you have left around the edges of the lasagna, and then cover with foil. Bake in a preheated 350 degree oven for about half an hour. *For ragu recipes, check here or here. If you are vegan or veg, skip the meat and use those little French lentils instead. I love those. Or tofu, I guess, if you're into that kind of thing. 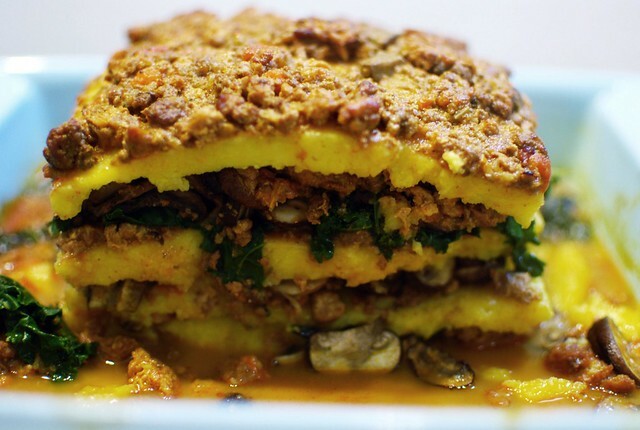 I love using polenta in place of noodles! Normally, I just buy the premade tubes and cut them into 1/4" thick circles. Either way it's yummy! Looks great. Thanks for this recipe! I just stumbled on to your blog. How I love poletna lasanga... delicious! This looks great! I have totally made gf gidgets version before...yum. Love that yours uses kale.